The absence of top notch goal-scorer, Zenatha ‘Torres’ Coleman during Saturday’s crucial match might have caused Brave Gladiators dearly as they succumbed to Tanzania by 2-0 in their Women African Championship opening encounter at the Sam Nujoma Stadium. The notable absentee known for her brilliance and mesmerising football skills in her quest to net home goals was a clear testimony that the Brave Gladiators need her service now more than ever. This was evident as the women national side so desperately wants to qualify and book a place in the championship finals to be hosted by Equatorial Guinea in November this year. Coleman who hails from a fine family of well acquainted footballers and daughter of former stalwart of Keetmanshoop-based Try Again Football Club, Johannes ‘Salute’ Coleman is reportedly pregnant. The 17-year-old attended trials in Germany where she seemed to be destined for greatness in her flourishing football career. However, last October, her “flourishing career” temporarily took a nosedive when Bocholt Football Club’s doctor discovered her pregnancy. Brave Gladiators Head Coach, Jaqueline Shipanga told The Villager that Coleman successfully completed the trials. Shipanga, who is equally disappointed with the outcome of Saturday’s match because of the poor standard of play by senior players included in the fold, said the outcome could have been different if Coleman’s situation was different. 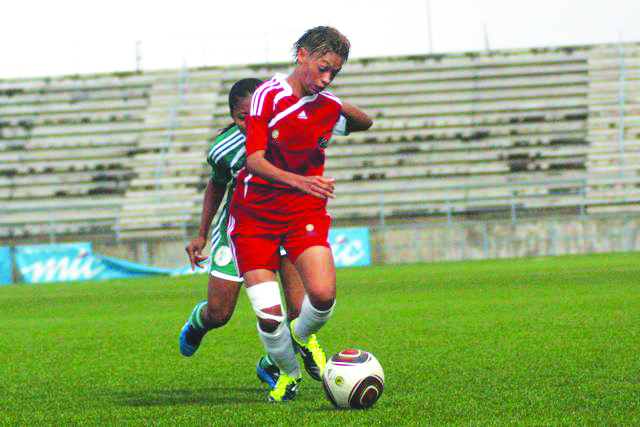 Coleman boasts an impressive tally of 20 goals in eight matches in the current Women Super League. The Brave Gladiators now face an uphill battle when they take on the Twiga Stars of Tanzania in their away encounter on 28 January in Dar es Salaam. “We brought in senior players like Rita Williams and Lethicia Manga and goal-minder, Susanna Eises since Tanzania are a very tough side but I must say that I am very disappointed with their performances on the day,” said Shipanga. The head coach who is not really impressed by the more experienced players brought in will instead opt for the national under-20 charges such as Lovisa Mulunga (under-17 captain), Lena Narises and Stacey Naris who are bound to give the Twiga Stars a run for their money during then return encounter in the East African country. Shipanga is confident of a positive outcome come 28 January, as she hopes to overturn the 2-0 deficit, adding that a two-all draw will have the team determine the winner by penalty shoot-out or the Gladiators will have to win by three clear goals to remain in the race. The vocal head coach introduced Veweziwa Kotjipati, Iina Katuta and Alberta Dawes in the second half for possible change of the game but the Twiga Stars were steadfast and solid in the defence and midfield department, giving little room for the Brave Gladiators to penetrate. Tanzania crushed the 0-0 deadlock in the 64th minute when left-midfielder Asha Rashid well-taken set piece found the back of the net, beating goalkeeper Eises while teammate Mwanahamisi Omary sealed the score line with a well-taken shot in the 89th minute. Brave Gladiators team include Susanna Eises (GK), Lethicia Manga, Esther Amukwaya, Stacey Naris, Uerikondjera Kasaona, Lorraine Jossob, Shirley Cloete, Thomalina Adams, Elmarie Fredericks, Rita Williams and Juliana Skrywer. Those in the reserve bench include Lydia Eixas, Veweziwa Kotjipati, Lovisa Mulunga, Iina Katuta, Novata Paulus, Lena !Noreses and Alberta Dawes. Twiga Stars: Fatuma Omaryjawadu (GK), Sophia Mwasikili,Fatuma Bashiri, Pulkeria Charaji, Fatuma Khatibu, Mwapewa Mtumwa, Mwanahamisi Omary, Etoe Mlenzi, Fatuma Mustapha, Asha Rashid, Fadhila Hamadi. Reserves: Maimuna Saidi, Mwajuma Abdallah, Aziza Mwadini, Rukia Khamis, Semeni Abeid, Zena Khamis and Siajabu Hassan.